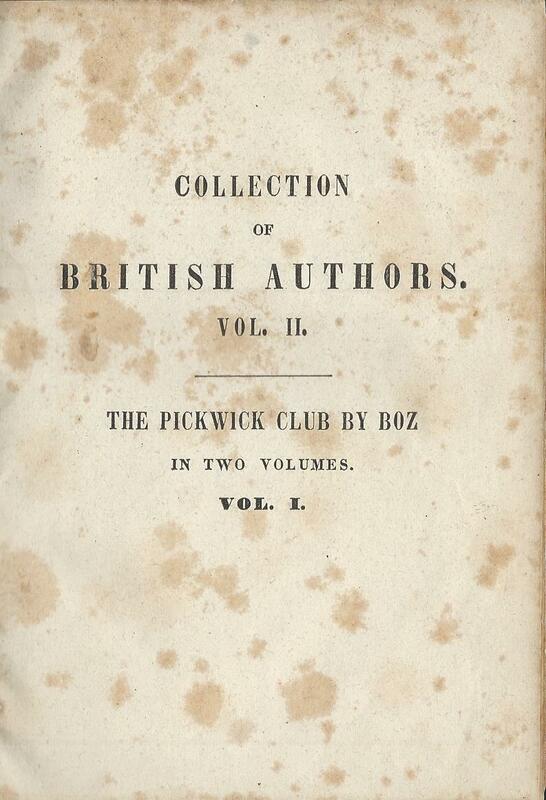 The Tauchnitz ‘Collection of British Authors’ started in late 1841 with ‘Pelham’ by Bulwer Lytton. Neither the book nor the author are much remembered today. But it was followed by what has surely become one of the best-known and best-loved books of the entire 19th century, written by the century’s most famous author. 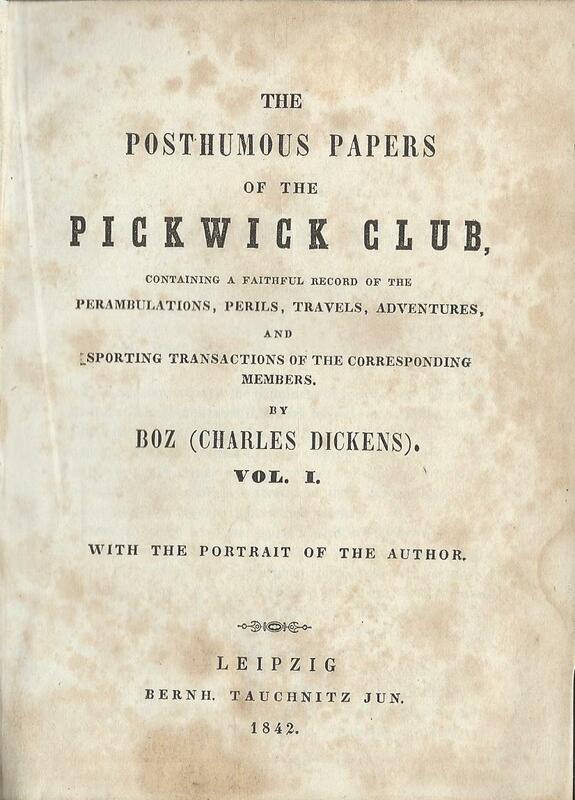 ‘The posthumous papers of the Pickwick Club’, or as it’s better known today, ‘The Pickwick Papers’ by Charles Dickens was published in two volumes as volumes 2 and 3 of the Tauchnitz series. 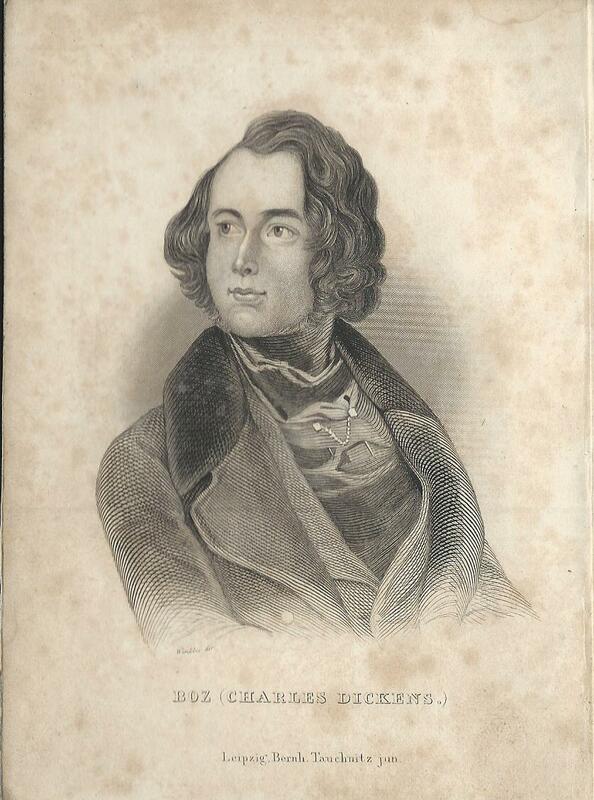 Dickens was only 24 when he started to write the Pickwick Papers, which appeared in monthly instalments over 1836 and 1837, with the first publication in book form in 1837. It was a publishing sensation in Britain and not surprisingly, rapidly attracted the attention of continental publishers. By the time Tauchnitz published it at the start of 1842 (or possibly late 1841), it had already appeared in English language editions published by Galignani and by Baudry in Paris and by Friedrich Fleischer in Leipzig. It had also been published in German language translations by Weber in Leipzig (from 1837) and by at least two other publishers (Eduard Leibrock and Vieweg und Sohn). All of these, and the first Tauchnitz publication too, were pirated. There was no international copyright agreement and none of those publishers would have paid Dickens a penny for the right to publish his work. Although Tauchnitz went on to make his name and fortune by offering payment to authors, notably Dickens, for the right to publish authorised editions, he too started off by effectively stealing their work. He went on to publish 5 further pirated volumes by Dickens, before finally offering payment for the publication of ‘Martin Chuzzlewit’ in 1844. 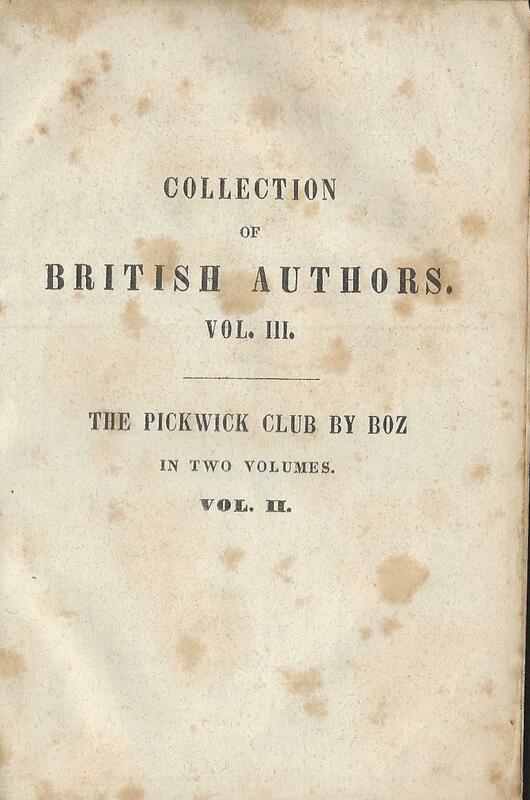 So the earliest Tauchnitz editions of The Pickwick Papers carry no reference to authorisation on the title page. As the book went on to be reprinted many times by Tauchnitz over the next 100 years, later printings are described as ‘copyright edition’, and the vast majority of copies now found are of this type. But at least the first two editions are distinguished by having no mention of copyright on the title page. 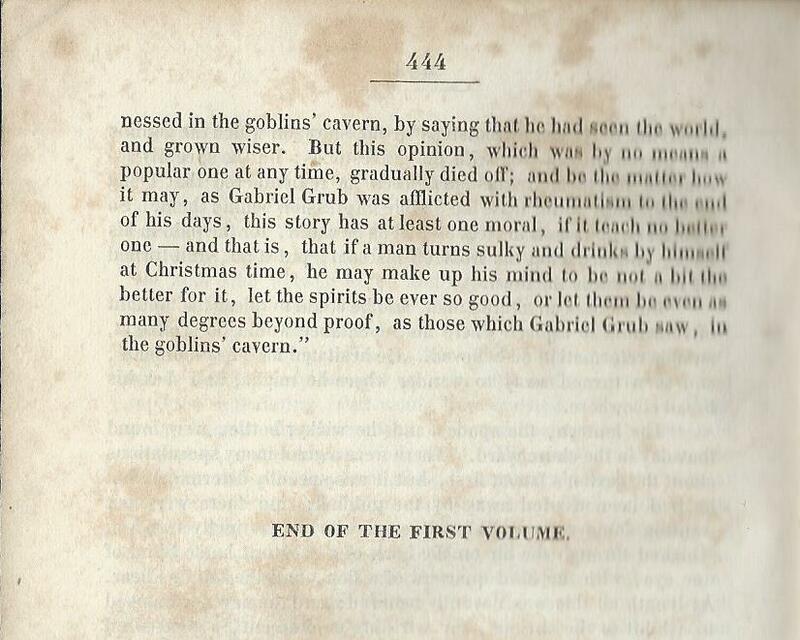 The first edition had 446 pages in volume 1 (and 427 in volume 2), but the first volume was quickly re-set with 432 pages, so few copies have survived of the very first printing. I have one in my collection and there are two copies in the Pressler collection, now in the National Library of Scotland. The bibliography records no other copies, although there are surely some out there. It’s certainly possible though that not a single copy in the original paperback state has survived. If anyone has a paperback copy, or even has ever seen one, please let me know. Posted on March 5, 2015, in Vintage Paperbacks and tagged Baudry, Charles Dickens, Galignani, National Libary of Scotland, Pickwick Papers, Tauchnitz. Bookmark the permalink. 11 Comments. Good luck with your book. It looks fascinating and you’ve clearly invested a huge amount of effort into research on this topic. I don’t think the Tauchnitz edition is a particularly significant one in the history of The Pickwick Papers, but it’s important in the history of Tauchnitz just because it was the 2nd and 3rd volume in a series that went on for over 5000 volumes. Also the history of the relationship between Tauchnitz and Dickens is fascinating and the Tauchnitz editions of some of the other Dickens novels are certainly key editions in their publishing history. I’ve just done a piece on Martin Chuzzlewit for instance, and there are other ones I hope to review soon.